This review of the $4600 Vibe Lithos 7 preamplifier with the optional $4000 Pulse power supply upgrade is the second part of a three-part review series that covers the impressive new top-of-the-line components from Tom Evans developed & manufactured in his Wales laboratory. 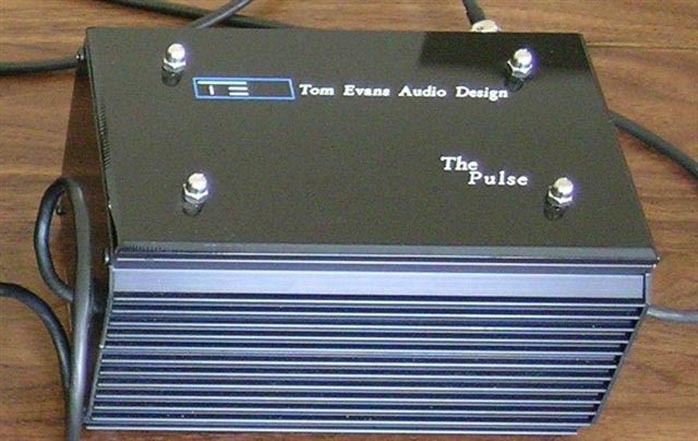 If you haven't yet read the August 2005 review Part 1 of the new Tom Evans Audio Design Linear A stereo power amplifier , I encourage you to go back and read it after finishing this preview. I cover a lot of the background, history and technical breakthroughs of Tom's designs there. As described in Part 1, the $8,500 Linear A power amplifier is so good, it's truly revelatory on my Avantgarde Duo 2.1 loudspeakers. When paired with Tom's Vibe Lithos 7 preamplifier and optional Pulse power supply, the Linear A astonished me in how it brought my Duos to life like nothing else ever has. 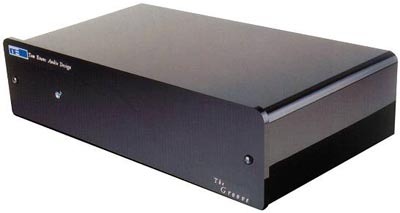 The Linear A was by a magnitude better in my system as any of the great SET amplifiers are better than an inexpensive mass-market receiver, both musically and sonically. say that everything I design has to blow me off the sofa (for the price) before I'll ever make it a production item. As a rule, I design the electronics to reproduce the spatial cues needed by the ear/brain to give that solid foundation needed to make coherent sense of the music. That hasn't been an easy task. It also has to be said that there is no single specification that really matters. There are too many variables to mention and they all matter - but some are higher on the list than others. What I can tell you is that when I listen to a Groove Plus Vibe with a Pulse or the Linear A or Bs (fully differential monoblocks), I am hanging on tight to the sofa." "People often ask what audiophile caps I use. The answer is none. Why? Because I have gone the extra mile. All signal paths are designed to be DC-coupled. For example, the result of using a cap in the signal path is that it first destroys the phase integrity of the music by time versus frequency), which then adds unnatural colorations and causes changes to the soundstage, giving it a bloated perspective with larger-than-life instruments that are out of perspective with the soundstage. With caps in the signal path, the edges of notes and the spaces between them are missing. High fidelity? I don't think so. No names mentioned, but many manufacturers are guilty of producing this kind of rubbish and have been getting away with it for years. As for the HiFi press, I avoid those who have no idea what good music is about. As Frank Zappa once said, "most people wouldn't recognize good music even if it bit them on the arse." What some in the press call "HiFi", we here at Tom Evans Audio Design call sonic porridge." Lucky for me, I was able to sneak in under the HiFi press wiretap with Tom for this review. I should of course point out that I was already a happy Tom Evans Audio Design customer prior to writing for 6moons. I'd already acquired my own Vibe with which I've have been living very happily ever after - well, at least until I heard the latest Lithos 7 Vibe in combination with the optional Pulse power supply. That totally blew me away, the hazard of being a reviewer. 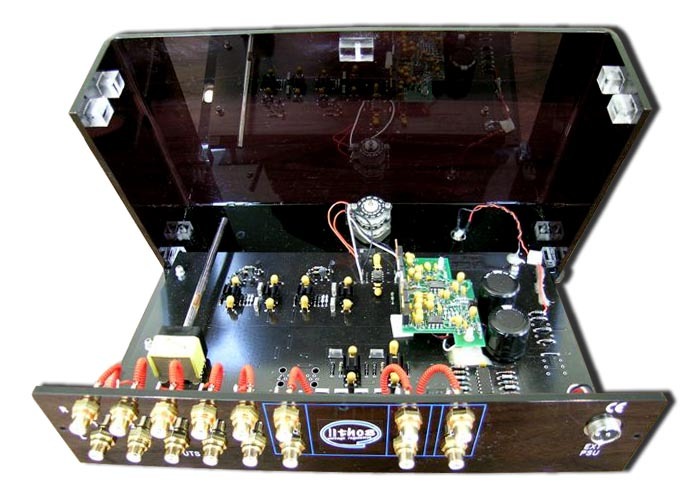 The Vibe Lithos 7 preamplifier is the result of 12 years of continuous development. A quick tour of the 7's exterior tells you that this preamplifier -- wrapped in slightly transparent Perspex -- is as singularly purpose-driven as a Ferrari Formula 1 race car. There are no attendant frills like a balance control, a headphone jack, mute switches or the like. What's there is dedicated to ultimate performance. 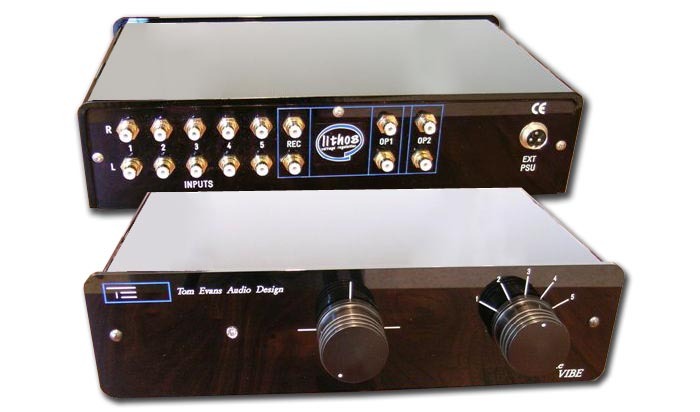 Tom told me that he designed the Vibe Lithos 7 preamplifier to provide control & gain to the input signal in a completely neutral environment that does not alter or color the input signal. The original input signal is as perfectly recovered and preserved as the state of art allows at this time. "While there are many factors in developing an ultra-performance preamplifier design like the Vibe, I have endeavored to meet them all without compromise." 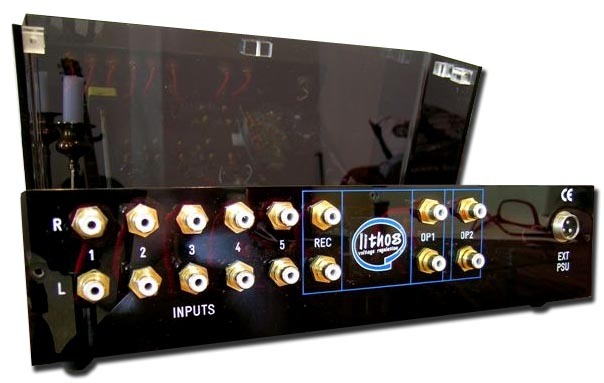 On the right of the front Perspex fascia, you see one knob controlling a Wessex Advanced Switching Products (WASP) selector that allows the user to select one of five sources. 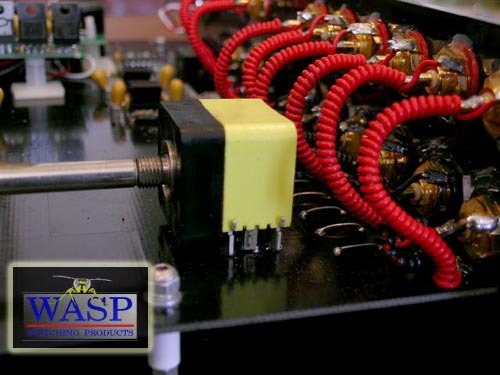 WASP is known as an innovator in the design and manufacture of ultra-performance switches for critical professional, military, instrument and telecommunications applications. 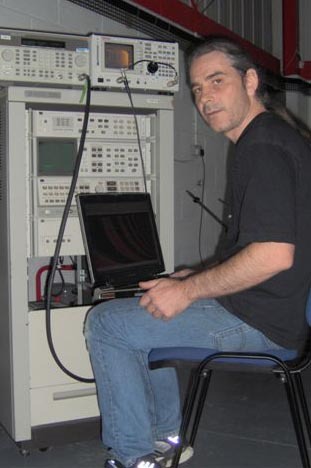 Tom chose WASP because for his application, he believes their switches are the best in the world. To the left of this source selector, a Danish Audio ConnecT (DACT) stepped attenuator controls volume with a channel-to-channel tracking accuracy of 0.05 dB (compared with an error of ± 10% from other manufacturers). The DACT utilizes a Surface Mount Devices SMD resistor network for short signal paths and very low series inductance and stray capacitance. The SMD resistors are mounted on a gold-plated spiral track for 24 steps of attenuation. The DACT's benefits of minimal distortion over a wide bandwidth, short signal paths and extreme accuracy make it the best attenuator of its kind there is. Naturally, it's made in Switzerland. The only other feature on the Vibe's front is a small violet power indicator. That's it. On the business end of things, you'll see 5 switched line inputs, one pair of buffered record outputs, two pairs of preamplifier outputs and a connector for the power supply. Tom's output stage uses current rather than voltage feedback to insure faster rise and recovery times (less than 10 nanoseconds), made possible because of the ultra-high performance Lithos regulators. With conventional voltage regulators, noise is too high to allow for this approach. Power supply noise would cause a significant reduction in resolution and dynamic range. However, "the intelligent use of current feedback enabled by Lithos regulation is a key feature in producing a more lifelike presentation because it greatly improves linearity and bandwidth. The Lithos regulation makes this possible by rejecting noise before it reaches any gain stages. Noise is eliminated and speed and resolution are far in advance of most designs as a result." The Vibe also utilizes error-correction circuitry and the application of psychoacoustic principles in its design. I asked Tom to elaborate a little more on that aspect: "It is a well known fact that the ear/brain is sensitive to changes in phase (time) versus frequency. It is in the ear/brain domain that the spatial cues are contained, which is one of the foundations for making some kind sense of what's being fed to your ears. To eliminate phase errors from my amplifiers; the Micro, Micro+, Groove, Groove+ phono stages; and the Vibe line stage; all incorporate 'active phase error cancellation' circuitry. This is why you now have access to so much more musical information and why it's become so easy to absorb what you are hearing. Next time you want to purchase a pair of loudspeakers, ask for specs on phase versus frequency. What should be a flat line will probably resemble something like a picture of the Rockies." I asked Tom if he'd take us on a guided tour through the signal path of the Vibe 7. "The printed circuit board used in the Vibe 7 is double-sided and through-hole plated. The PCB has been designed with both top & bottom ground planes tri-split to control earth current paths. The signal enters through hardwired silver/Teflon cable to the PCB. 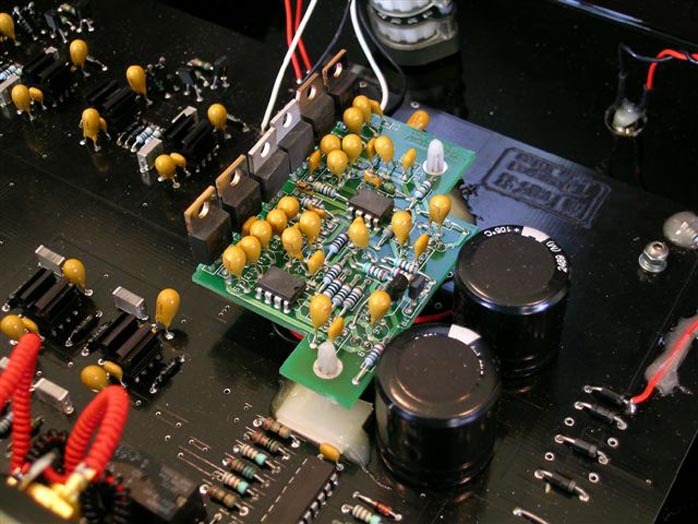 The signal passes through the WASP selector switch into the gain stage which has the high input impedance and low output impedance necessary for maintaining signal integrity whilst driving the DACT pot to maintain the rising and falling edges of notes. 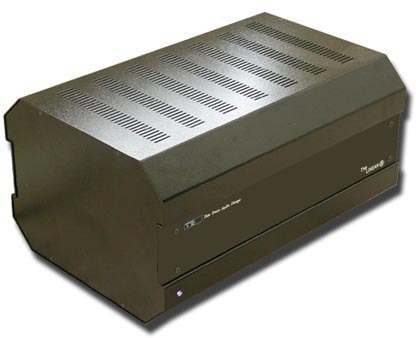 The output stage has very high input impedance and a low enough output impedance to drive a good 100 meters of interconnects without sacrificing signal integrity. The Vibe gain stage is a DC-coupled design with no capacitors in the signal path to accurately reproduce wide bandwidth. That is far harder to design than your normal AC-coupled preamplifier with ugly non-linear capacitors in its signal path. Hanging off the output stage is a relay DC detection/protection circuit that in the case of brownouts will break the connection of the Vibe's outputs to the power amplifier. This protects both loudspeakers and DC-coupled power amps from potential damage through failure of any source components. This circuit delays power up for 8 seconds while it checks the system, then remains active at all times during the unit's use and will immediately isolate the output if DC is detected. This only operates below 3Hz and is inaudible. Power is supplied to the circuit via ultra-fast/low-noise Lithos 7 voltage regulators [below]." Unless you've already read the review of the Linear A amplifier that covers Tom's development history of Lithos voltage regulation, you're probably wondering what Lithos 7 is all about. Lithos refers to the range of regulators that Tom has developed to dramatically increase the performance envelope of his designs, each of which Tom has designed to be optimal for different tasks. In case you're wondering where the name Lithos came from -- I was -- Tom explained it as "Greek for rock, as in a rock-solid, ripple-free, stable, wide bandwidth Class A +/- voltage regulator. My mother was born in Athens and I named my 5-month old baby girl (my latest product) Athena so I guess the connection is obvious." 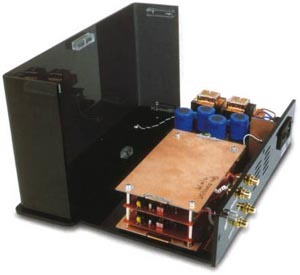 Tom claims that commercially available voltage regulators suffer voltage noise equivalent to the output of a moving coil cartridge. If you want to uncover all of the information contained in very small audio signals -- like those output by moving coil phono cartridges -- you want an audio signal with the minimal possible corruption and maximum possible dynamic range. This requires vanishingly low noise. If noise and signal are similar in magnitude, a significant amount of data is irretrievably lost. Off-the-shelf regulators also exhibit very slow transient response and recovery times, compounding the signal degradation begun with the noise issue. Tom decided that the only alternative was to develop his own high-performance high-speed regulators, which he christened Lithos. His first efforts at designing them yielded results that were a staggering 1000 times quieter, 53 times faster and 100,000 times more accurate than the best commercially available regulators used for audio applications at the time. These early Lithos regulators provided huge advancements in speed and resolution that made for a much better sounding, more detailed and life-like musical experience. Over the years, Tom continued development of the Lithos regulator technology and produced versions 2, 3, 4, 5 (also made available for third-party OEM use), 6 ("the big one") and Lithos 7 for similar performance improvements. The Lithos A (for analog) was Tom's first +/- voltage regulator, which was then replaced by the 7. The Lithos 7 was designed for local regulation whereas the Lithos 6 was designed for pre-regulating multiple Lithos 7s for deeper regulation, hence the blacker-than-black backgrounds with serious dynamic range and resolution (all original design goals). The Lithos 10 has recently been developed and will be appearing in a new product. All older Vibe preamplifiers are upgradeable to the current 7 status. Contact US Importer Ed Sheftel for details. Tom provides a stock power supply for the Vibe 7, a "transformer in a box" to get you up and running." 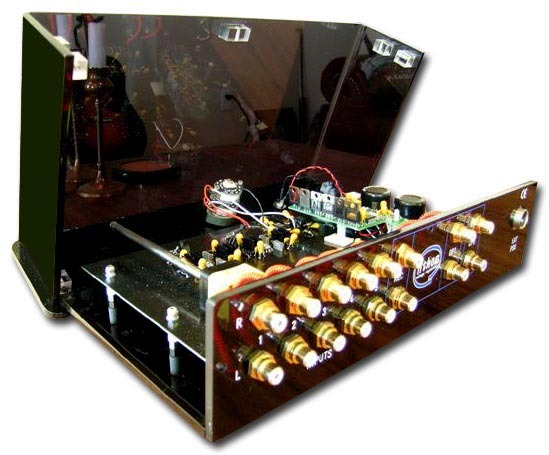 I understand that not many people can afford to purchase a state-of-the-art preamp in one hit. By offering the Vibe and Pulse as separates, people can start with the Vibe and add the Pulse to get to the next level of performance when they can afford to." I think the separates approach is a great strategy on Tom's part and shows sensitivity to his customers' needs by allowing them to progress towards ultimate performance in a more wallet-friendly fashion. I asked Tom if he'd take us on another walk through the Pulse power supply. 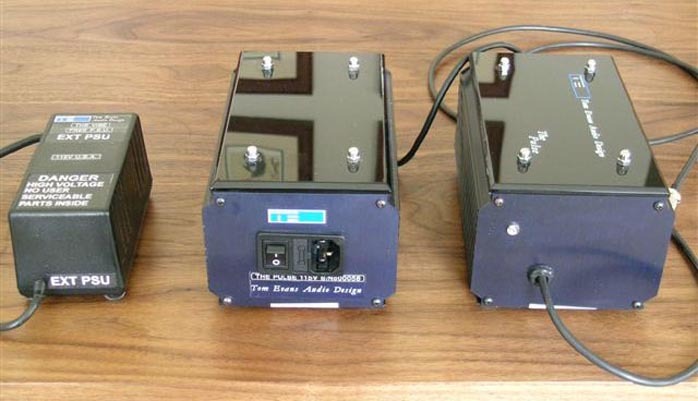 "In box 1 of the Pulse, the mains supply goes through an in-house designed and manufactured 70-watt transformer with an electrostatic screen to remove RF contamination, then through ultra-fast soft-recovery rectifier diodes and 18,800 µF of smoothing caps, then regulation before leaving box 1. Upon entering box 2, it is regulated again and then smoothed by 9400µF caps, then regulated again by my +/- Class A regulators. Then it enters the preamp box to meet the Lithos 7 local Class A regulators. The combination of Pulse and the Lithos 7 on the Vibe PCB lowers the noise to a theoretical -186dB, hence the blackest of backgrounds." As a teaser to the full review, let's just say that the Vibe with Pulse power supply & the Groove Plus phono stage are in the same exalted league as the Linear A amp. When used together, they are - well, truly remarkable. Expect to see Part 3 of this TEAD review series on the Groove Plus -- including ruminations on the full system effect of the complete suite of Tom Evans gear on my HiFi psyche as a wrap-up -- shortly.